Today’s post is contributed by my nephew, Jon Sacker, who lives in London. 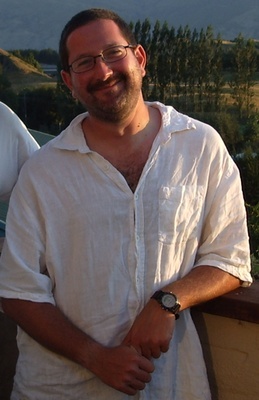 Jon loves to cook and is a frequent contributor to startcooking.com. Jon was 100 percent correct when he pointed out in a previous post on measuring cups and other essential kitchen utensils that not everyone does measuring the way Americans do – by volume. Much of the world uses the metric system and measures by weight. Here Jon explains to us how to measure using a scale. George Bernard Shaw once described Britain and America as two countries divided by a common language. This is certainly true when it comes to cooking (after all, you broil while I grill) but it gets even more complicated when it comes to translating cooking instructions, because it’s not only the words we use, but the actual way we cook which is different. 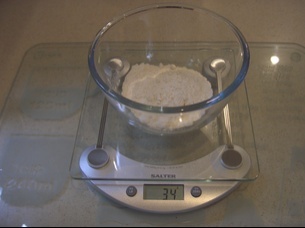 These days however in the UK like most of the world, recipes use the metric system of litres (l) and millilitres (ml), grams (g) and kilograms (kg), and degrees Celsius (or Centigrade) (°C). To make matters even more complicated, the pint is different between the UK and the USA. There are 16 fluid ounces to the pint in the US, and 20 in the UK. So how do we cook here in Britain? 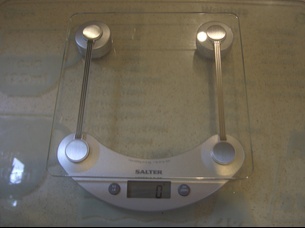 As has been mentioned in our earlier discussion on essential kitchen utensils a set of kitchen scales is an essential piece of equipment. Traditionally these were balance or mechanical, though most these days are electronic and are very easy to use. 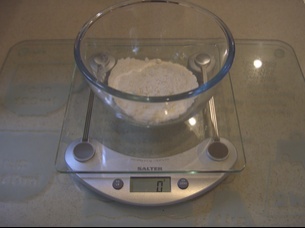 The most important things to remember when using scales is that the weight must be set to zero. 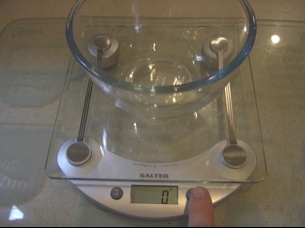 While this may sound obvious, if you are using a set of scales like mine, which need the addition of a bowl for many items, if you don’t re-zero, you’ll be in all sorts of trouble. 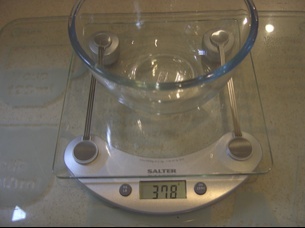 The great things about using scales like these is that, as long as you remember to re-zero, you can just keep on adding different ingredients to your mixing bowl. Don’t be put off by British recipes, they really are so very simple, after all you don’t have to remember whether you ingredients are levelled or flat – just pour it in until you have the right weight! Thanks, Jon. That was really helpful. Over at the MCC, we try not to use any kind of real measuring quantities, wecooking disciples don’t really handle it too well. We tend to measure things in pinches, punches, fistfulls and seconds. It works well for us so far. “Pinches, punches, fistfuls and seconds?” Hmmm, not too sure about that for beginner cooks! I say, learn how to do it properly first, then break all the rules! Redeye, I agree with you to some degree – but it really does depend on what you are cooking. I’m not sure that your methods would work if you where say doing some baking. Jon, your right, yet our stlye of cooking is bish bash bosh…at this stage, showing that pretty much anyone can cook a decent dish or 2. Also it’s important to gain some confidence & nerve around food & the kitchen before getting into the nitty gritty & science of it all. Judging by the speed which my disciples pick things up, I’m sure this will come. & anyway that’s why we,ve got Kathys’ blog to refer to. Hi Patrick, keep bishing, bashing and boshing and I’ll be here if you need me! Is this a regular English teaspoon or a measuring teaspoon? You should use a measuring teaspoon.